An industrial strength manufacturing system that allows you the flexibility to choose just the functionality you need for your organization. Sage 300 Manufacturing?s Manufacturing Order is an easy-to-use manufacturing solution for small to medium-sized enterprises. Using Sage 300 ERP SDK, its design is fully integrated with Sage 300 ERP Finance and Logistics modules. 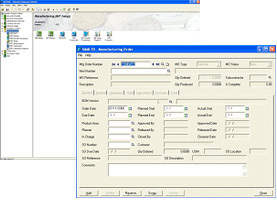 Simple yet powerful, Sage 300 Manufacturing enables an efficient manufacturing operation flow covering material purchase, processing manufacturing orders, work in progress, routing cost calculation, material consumption, material scrap and item substitution and order closeout. The design of Sage 300 Manufacturing?s Manufacturing Order is conceptualized to fully accommodate users? business processes needs and expectations. Supports multi-level Bill of Materials (BOM) structure. Unlimited number of BOM codes and revision numbers per item code. BOM based on standard formulation quantity for each product. Define scrap factors/production allowances for each component in the BOM. Archive Engineering Change Notice (ECN) information for each BOM structure. Use the different BOM status to manage items structure information. 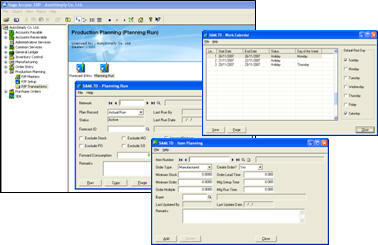 Plan, schedule, release and track manufacturing orders (MO) to better manage the production floor. Link MO with outstanding child or subcontract MO?s. Link MO with open sales orders (Sage 300 ERP OE) and purchase orders (Sage 300 ERP PO). Perform full and partial material issuances. Record production scrap and return of materials from the shop floor. Perform full and partial product receipts. Close out manufacturing orders (MO) and calculate actual costs and production variances. Cost of production is calculated at the point of posting. Material issuance cost is based on actual Sage 300 ERP IC inventory issuance cost. Finished good production cost is calculated as the sum of actual material issuance cost plus applied resource and tools cost divided by actual produced quantity. In order to accommodate partial manufacturing receipts, output is cost initially based on standard costs but is recomputed to actual upon MO closeout. Production floor is divided into work centers which are in turn accessed through production routing operations. Material components in a BOM is assigned to a distinct operation in the bill of manufacturing. Perform material issuances or returns by operation instead of just by MO. Perform production scrap by operation. Perform WIP allocation by operation. Perform material receipts by operation instead of just by MO. Production costs are classified as material costs, overhead costs, labor costs and tool costs. Material costs are further categorized as either direct or packaging. Material (direct and packaging) standard costs are derived from Sage 300 ERP IC standard costs. Overhead costs can be fixed or variable. Labor costs are composed of setup labor and direct or run-time labor costs. Resources and tools can be applied to work centers for costing purposes. Assembled standard costs derived from the BOM can be exported to Sage 300 ERP Standard Costs. Materials issued from Sage 300 ERP to an open Manufacturing Order (MO) is considered WIP. Manufacturing Orders may be grouped into Production areas/zones for purposes of tracking and management. WIP is consumed via the MO allocation transaction. MO closeout automatically allocates unconsumed WIP. Users have the option to keep track of WIP in the shop floor and generate current or historic WIP reports. Provides for multiple component substitutes rated according to preference. Allows user triggered component substitution during MO Issuance based on inventory availability. Tools are assets which are consumed during the manufacturing process. Consumption of tools may be fixed or variable. Tools can be categorized to user-defined tool types with pre-defined standard costs. The Tool Master allows the maintenance of actual tools with beginning quantities and actual costs. These tools are applied to MO?s and contribute to the actual product cost posted to Sage 300 ERP IC. Sage 300 Manufacturing's Production Planning module is an easy-to-use production scheduling and materials requirement planning solution for small to mediumsized enterprises. Developed using Sage 300 ERP SDK, it is fully integrated with Sage 300 ERP's Financial and Logistics modules. The P/P module is the second installment of Sage 300 Manufacturing's manufacturing suite for Sage 300 ERP. It makes full use of the manufacturing and BOM information in Sage 300 Manufacturing's Manufacturing Order (M/F), sales information as contained in Sage 300 ERP O/E, stock data within Sage 300 ERP I/C and purchase information in Sage 300 ERP P/O. With Sage 300 Manufacturing's P/P module, Sage 300 ERP can now truly generate a full blown basic MPS and MRP plan! Supports unlimited number of P/P Distribution Networks. Actual Sage 300 ERP O/E sales orders can consume user-defined sales forecasts thus preventing excessive estimation of item demand. Time buckets are applied to planning run results. No need to re-run planning module to switch from one time bucket to another. 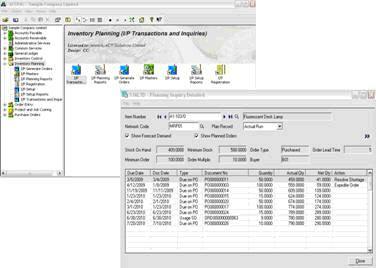 The Inventory Planning (I/P) module is an easy to use purchase planning solution for small to medium-sized trading enterprises. With I/P, trading companies can now generate full scale purchasing plans for all their inventory items. Sundae Solutions helps business and organizations gain maximum advantage from communications technology. We create value and competitive advantage by combining a deep knowledge of networks and networked applications with proven skills in business consulting, change management and innovation.